Paint FEARLESS Mexico Alumna Only! Please email Support@DirtyFootprints-Studio.com to be put on the waiting list. 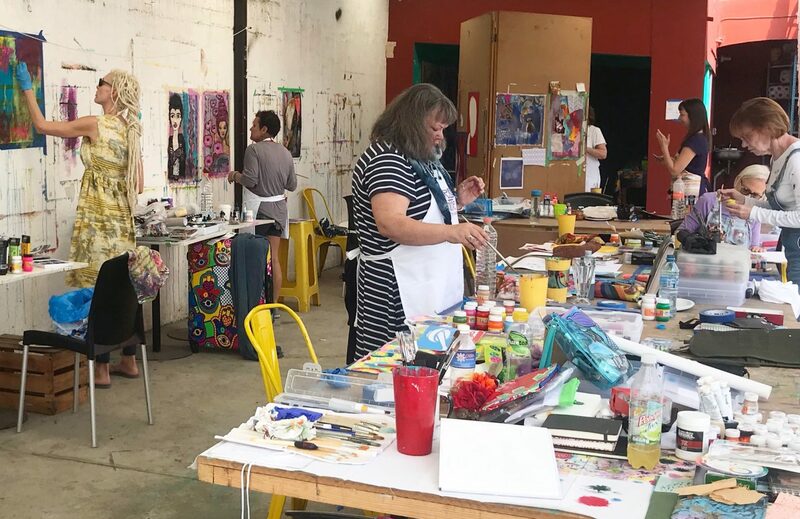 THIS WILL BE MY LAST & FINAL PAINT FEARLESS MEXICO & IT IS OPEN TO PAINT FEARLESS MEXICO ALUMNA ONLY! 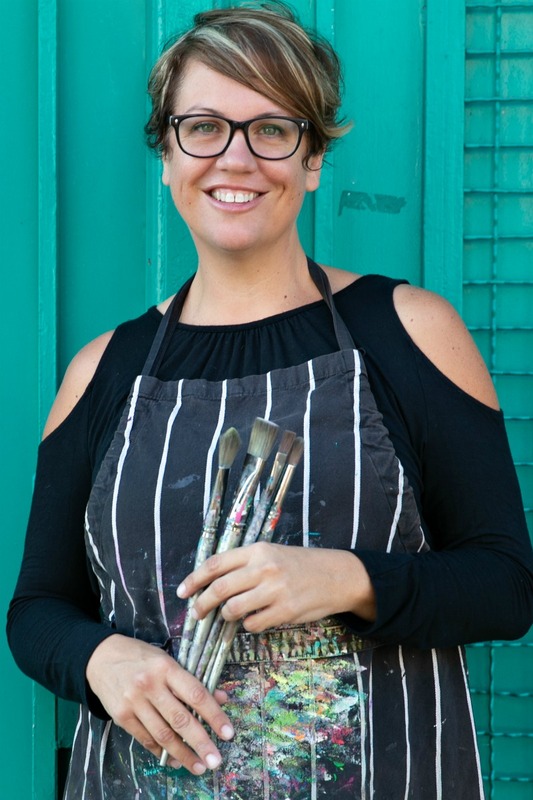 This will be my last and final Paint FEARLESS Mexico retreat and sugar cube, we are going to have an amazing time! We’ll take in new sites. See new art. Meet new artists. Try out new restaurants. But most of all we’re going to paint like our hearts are on fire. My final Oaxaca retreat is open to alumna only because I can’t imagine spending my last time in Oaxaca with anyone else but you. You know in your bones what magic Oaxaca holds — so lets go deeper. Lets end one decade and begin another — it’s 2020!!!! This retreat is going to be so bittersweet, so incredibly special, so perfect in that Oaxaca kind-of-way. 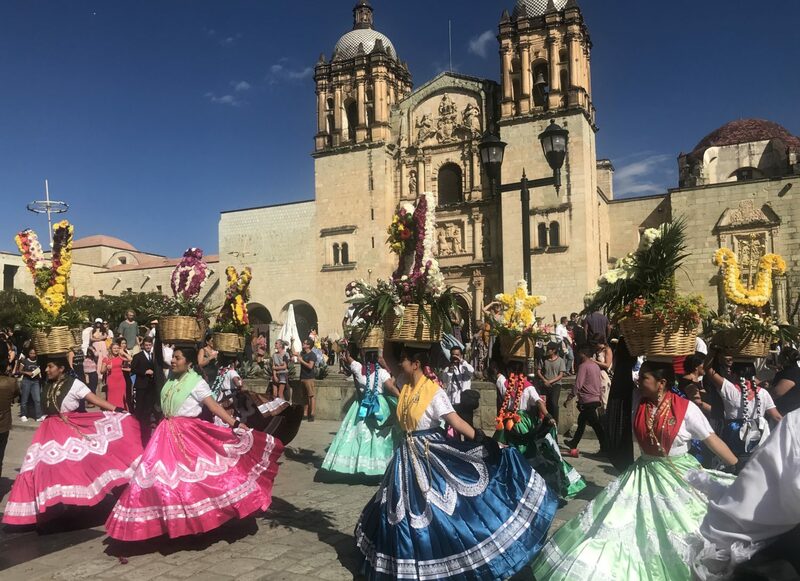 Come join me in Oaxaca one last time January 13-20, 2020 . SOLD OUT! Please email Support@DirtyFootprints-Studio.com to be put on the waiting list. Please read all of the following details before registering. Your payments acts as agreement to the terms listed at the bottom of this page. Monday: We’ll begin with tapas and orientation starting at 5 PM. Tuesday: Breakfast. Morning workshop & FEARLESS® Painting. Lunch. Break. Afternoon workshop & FEARLESS® Painting. Wednesday: Breakfast. 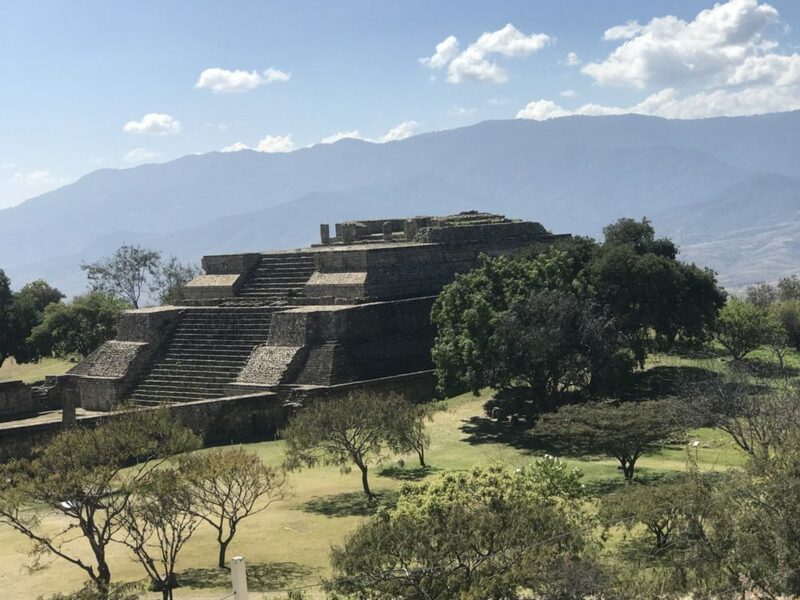 Visit Monte Alban, a large pre-Columbian archaeological site in the mountains of Oaxaca, where we’ll sketch, stroll the museum and gift store, and have lunch at its scenic cafe. Thursday: Breakfast. Morning workshop & FEARLESS® Painting. Lunch. Break. Afternoon workshop & FEARLESS® Painting. Friday: Breakfast. Morning Workshop & FEARLESS® Painting. Lunch. Visit to the Painting Museum to see the new show. Afternoon workshop & FEARLESS® Painting. Saturday: Breakfast. Visit Oaxaca’s paper factory founded by artist Francisco Tule, the Tule tree, and the studio and home of a Zapotec weaving family in the town of Teotitlán del Valle. We’ll also have lunch and if time permits we’ll visit a mezcal factory on the ride back to Oaxaca. Sunday: Breakfast. FEARLESS® Painting. Lunch. Final shows. Closing circle. Farewell dinner. Monday: Check out is at 11am. We will spend a day at Monte Alban sketching, touring, visiting the museum, and enjoying lunch at the scenic cafe. 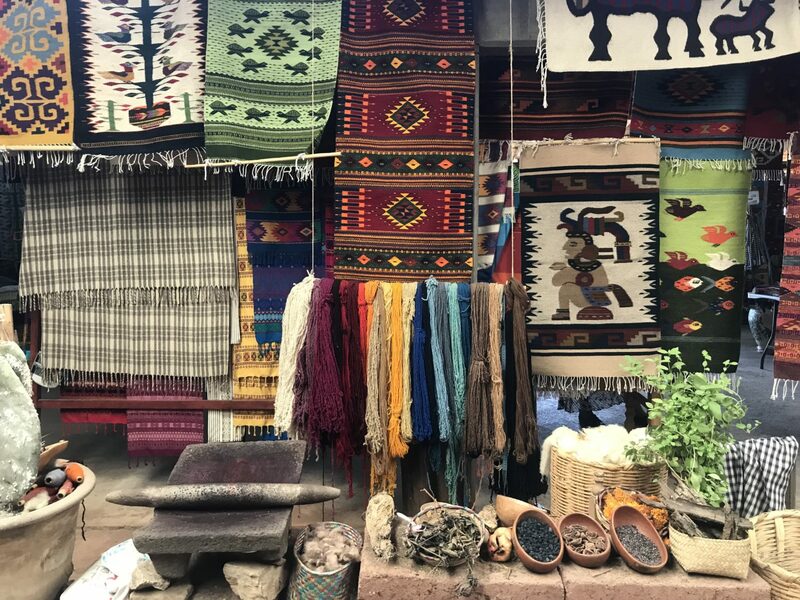 We will also journey across the countryside to the weaving village of Teotitlán del Valle where we’ll visit the workshop of traditional Zapotec weavers. And of course, we are going to do tons of FEARLESS® Painting! Here are the important details! STARTS:: Monday, January 14, 2020 at 5pm with tapas and orientation. ENDS: Sunday, January 20, 2020 with a group dinner (dinner not included). CHECK-OUT: is on Monday, January 21, 2020 by 11am (breakfast included). 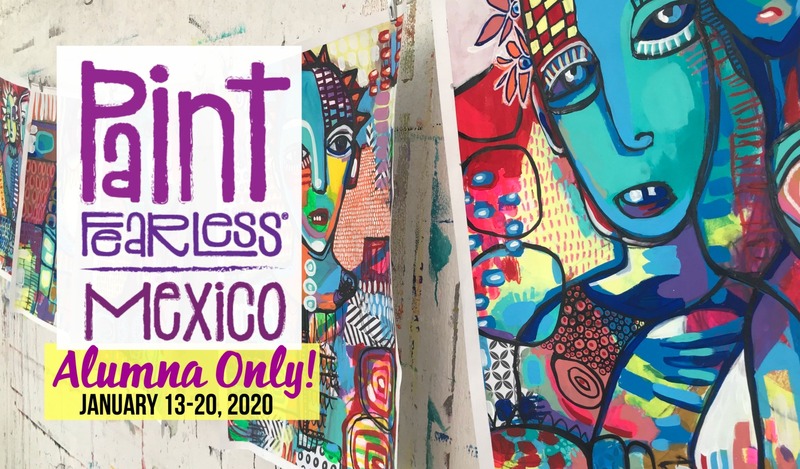 SPACE IS LIMITED TO 10 PAINT FEARLESS MEXICO ALUMNA AT EACH RETREAT & INCLUDES DOUBLE OCCUPANCY LODGING. THERE ARE NO INDIVIDUAL ROOMS. 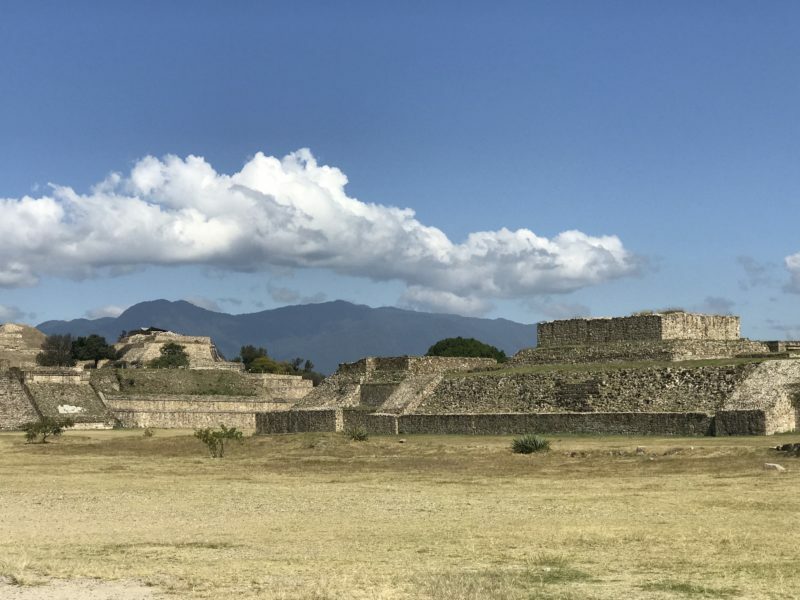 — Guided visit to Monte Alban archaeological site for touring & sketching. — Guided visit to the Oaxaca Paper Factory, the Tule tree, and to the village of Teotitlán del Valle . — A special FEARLESS® Painter ALUMNA ONLY apron. A deposit of $500 USD will hold your space. Cancellations made before October 1, 2019: Refunds, minus a $155 service fee, will be made until October 1, 2019. On and/or after October 1, 2019 your registration fee is non-refundable. Please email your cancellation to Support@DirtyFootprints-Studio.com with your full name and email address you used to purchase registration. Your refund will be issued via Pay Pal within 72 business hours of receiving your cancellation. The final balance of $2150 is due by October 1, 2019. You will receive an invoice from us for the final balance in September. We will contact you in August to inquire if you would prefer to pay the balance in two monthly payments a month apart instead. On and after October 1, 2019: ALL SALES FINAL.